Lahore (Agenzia Fides) - The Department for Immigration Office at Allama Iqbal airport in Lahore stopped young Catholics who, on 23rd and 24th January, were about to embark to participate in World Youth Day, underway in Panama. 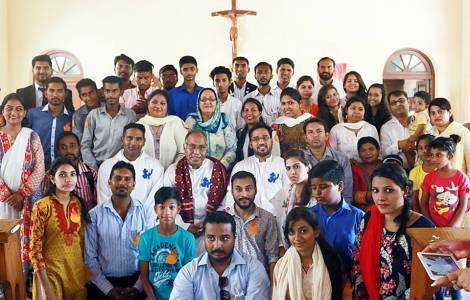 As Agenzia Fides learns, the Pakistani Catholic delegation was blocked and 14 young people, provided with a regular visa, were not allowed to travel. Only the Jesuit seminarian Emmanuel was allowed to embark. Paul Mohan, coordinator of the Catholic Youth Commission of the Diocese of Hyderabad, tells Fides about the misadventure and the bitter disappointment: "On the morning of January 23, we passed the security checks at the airport and collected the boarding passes to reach the Immigration Office. They kept us waiting for more than an hour and then they refused us permission". He continues: "It was a very sad fact for the whole group, we tried a way out, talking with the members of the Office and with the officials of the airlines, we changed the ticket for the following day, paying a penalty and hoping that everything will be clarified. But the next day, the Office stopped us again, even though we all had a regular visa and the letters of accompaniment of the Bishops". The plane ticket that the young people bought, costs 300,000 Pakistani rupees (about 1,800 euros). Atif Sharif, Coordinator of the "Jesus Youth" movement in Karachi, speaking to Fides said: "It is a valid discrimination: if you meet the criteria, if you have the regular documentation requested by the Consulates of foreign countries and you get a visa, a citizen must be free to leave, among other things, there was a huge investment for a trip abroad, and today our government discriminates against us". "The right to movement, including the right to travel, is a fundamental right of every citizen, in some cases the government can enter the names of some citizens in the special exit checklist, applying a restriction to prevent expatriation. But if this is not the case, government departments can not prevent people from traveling, if they have all the documents in place", notes Fr. Bonnie Mendes, priest of Faisalabad. Fr. Mendes affirms: "At this point a political and legal battle is needed to protect this right. It is a matter that the Justice and Peace Commission or the Human Rights Commission will have to face".